Without its badges, the Mercedes-AMG E63 S looks like a normal Mercedes saloon – long body, sleek lines, and radiates a luxurious vibe. But, we all know that it isn't a "normal" car. With its acclaimed performance and outstanding numbers coming from under its bonnet, the AMG E63 S is a speeder. So much so, that it faced the BMW M5 Competition in a drag race but unfortunately lost that one. This time, however, the fiery executive saloon is facing another track monster, albeit, in a different flavour. The MK kit car is a track toy and it has an unusual set of power plants. The MK track toy, with its body that's reminiscent of a Caterham, is actually powered by two Kawasaki ZX-10R engines. Each engine can allegedly produce 180 bhp for a total of 360 bhp. 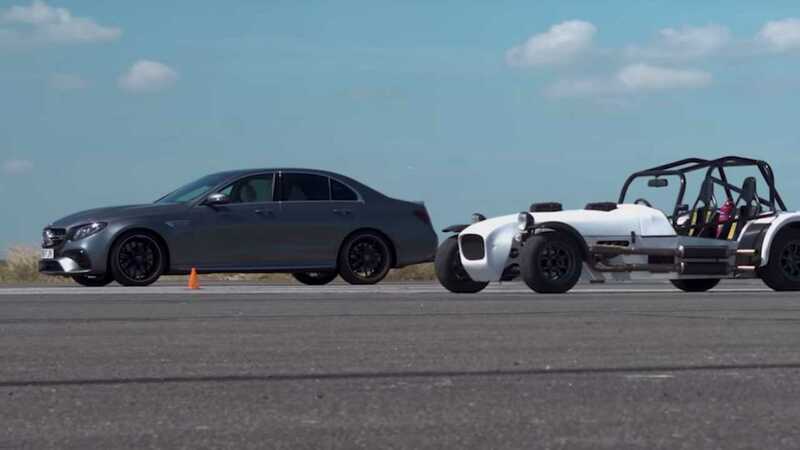 While these total power output would obviously underwhelm the AMG E63 S, the motorcycle-engine-powered track toy has an ace up its sleeve – its weight. It only weighs 530 kilograms, which gives it a power-to-weight ratio of 670 bhp per ton. Not bad, really. The AMG E63 S, on the other hand, churns out a maximum of 603 bhp and 627 lb-ft torque. Although, with its twin-turbocharged 4.0-litre V8 residing under its bonnet, it can go from zero to 60 miles per hour in just 3.3 seconds. Plus, it has all-wheel drive, which could be a major disadvantage against the MK track toy – not that the AMG E63 S should worry. With these facts laid out, which do you think will win in this straight-line race? Watch the video on top of this page to find out.